Emsisoft Online Armor is a firewall for demanding users who would like to have full control of all security-related processes in their OS. The improvements are mainly technical: The new version 6.0 contains many refinements and optimizations which you will see during installation in particular and also during every day use. Before telling anything more, let me recall some things about Online Armour. This Firewall was originally developed by Australian company Tall Emu Pty Ltd under the project administrator Mike Nash. This software was hugely developed under the careful testing of Wilders Security Forum Members. Older members of Wilders Security may still remember the thread titled “anyone heard of Online Armour?” (2005) where it was first introduced and then Mike Nash joined the forum and cooperated excellently with Wilders Security members who tested and gave feedback for the gradual development of the software to its best. 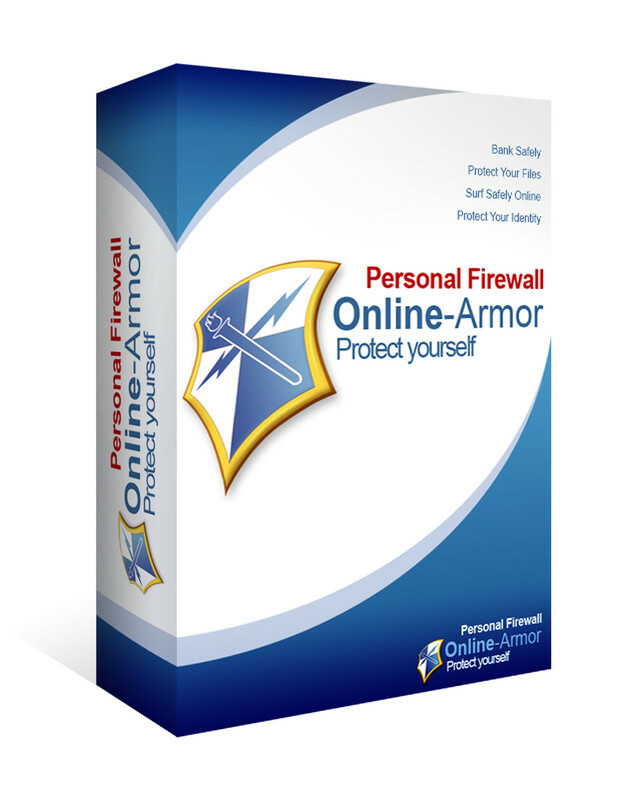 Online Armour have been considered one of the top HIPS firewall for quite a few years. Austrian company Emsisoft took over Online Armour on 2010. Emsisoft took good care of Online Armour but we old times still miss Mike Nash + Online Armour discussions at Wilders Security. 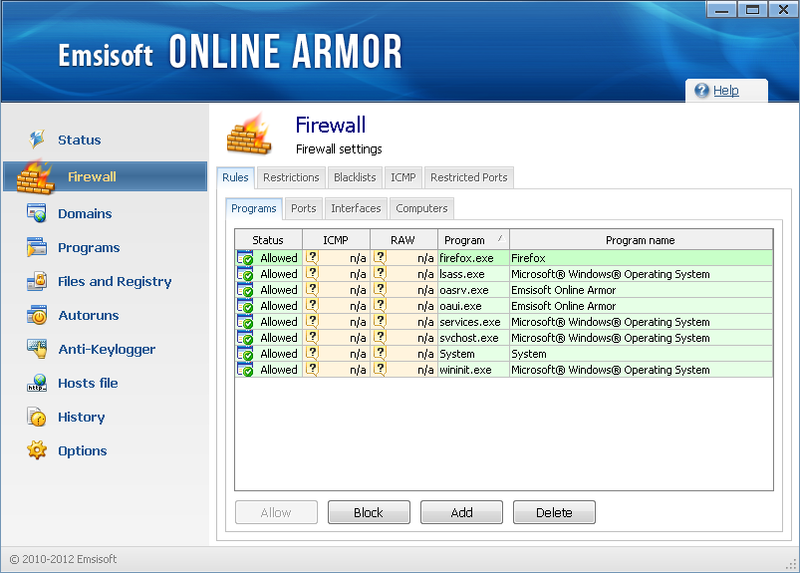 Online Armour comes as both a Freeware and Premium versions. the Freeware version isn’t featured on Emsisoft website but can be found on Online Armour original website. The Freeware version hasn’t also been updated to the latest version. In fact after the trial period of the Premium Version only the standard mode remains available and important security components and functions are deactivated and so you can have the latest Freeware version. The main features of the premium version, as stated in the website is the following. Keyloggers are a sort of malware waiting for key strokes invisibly in the background. Those keystrokes then are usually sent to a hacker – for example when entering a Paypal login, or the PIN of an online banking website. Online Armor works reliably here and reports all suspicious programs recording keyboard sequences. A permanently controlled whitelist collects the names of programs, which are assumed as safe despite such routines. Where programs are on the whitelist, Online Armor will not bother the user. A lot of programs automatically start together with Windows – whether this is desirable or not. Online Armor lists all autostarters and allocates them a security status (secure, not secure, unknown). The user may then decide on his/her own whether these programs are allowed to start in the future or not. 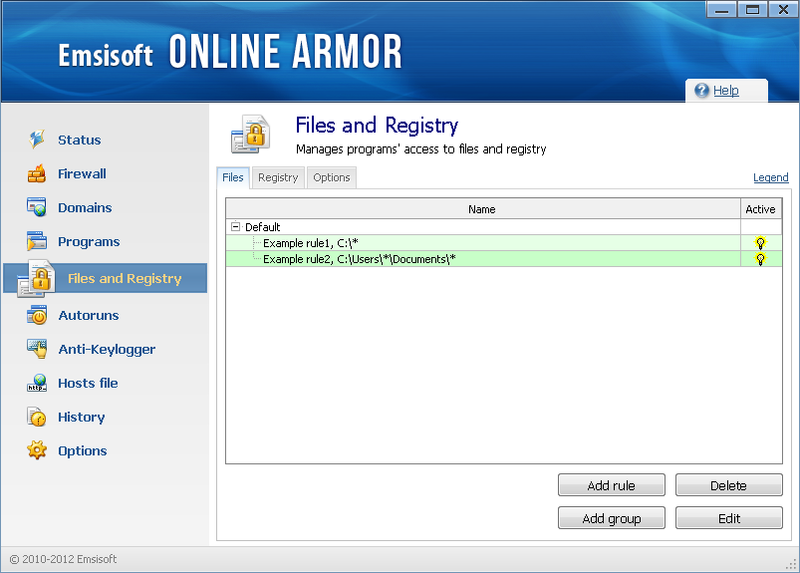 Online Armor again offers a whitelist containing many secure programs the user can safely trust. 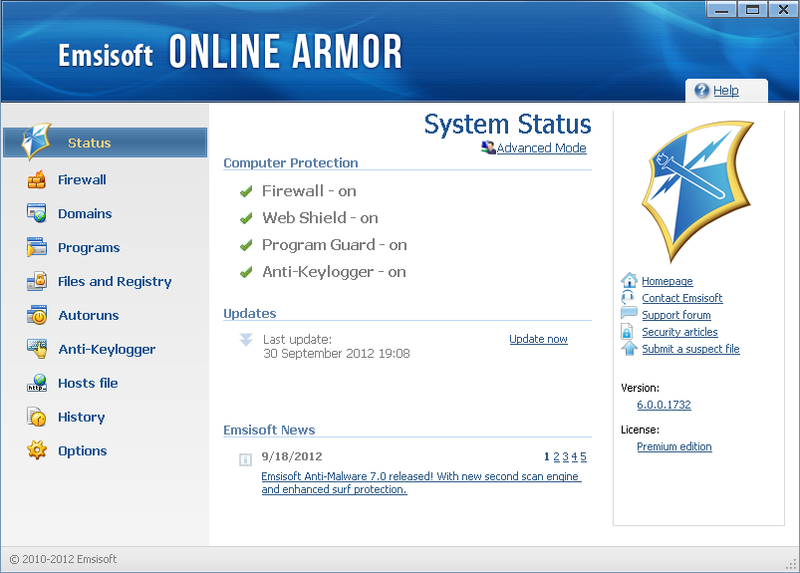 Suitable for Windows 8: Emsisoft Online Armor now supports Microsoft’s latest OS. Easier installation: The lengthy initial scan launched by default after installation has been removed, as programs are analysed in real-time when they are started. Online Armor is therefore up and running quicker and you save valuable time. Optimized performance: Efficient rules make Online Armor run noticeably faster. Ideal for use with Emsisoft Anti-Malware! Fewer alerts: Due to the redesigned certificate check you will hardly receive any alerts despite HIPS technology, allowing you to work without being disturbed. Emsisoft Online Armor is available for US$ 40 for the first year and supports all Windows versions since XP in 32 bit, and Windows 7 and 8 in both 32 and 64 bit. The software can be trialed for 30 days without limitations. The trial version can be downloaded from the following link. I haven’t tried the latest version. Frankly speaking, I have never have used Online Armour for a long period. Every time I installed it either to do beta test or to test any stable version. In fact I prefer basic, silent firewall. But if you really prefer a robust firewall, Online Armour would never let you down. It is a consistent performer of proactive security testing organization Matousec. Only complain with Online Armour used to be that it seems heavy in some systems (mine included) but may be the latest update have resolved it. If I get time to fully review it I will inform my experiences.